Help save our planet and revamp your wardobe at the same time. 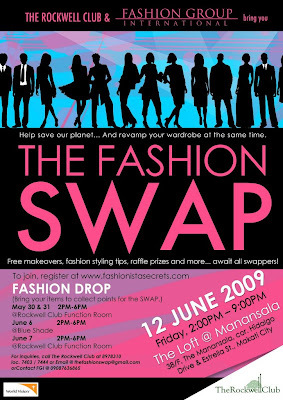 A friend invited me along with some other barkadas to attend The Fashion Swap this coming Friday in Makati, Manila. It will be an all-day of free makeovers, fashion styling tips, raffle prizes and more. A fashion expo organized by The Rockwell Club and Fashion Group International which will be attended by the most fashionable and the trendy swapping each others' items. Hmm, another "shutter-happy" and "1-2-3-click" moment for me. I am, as always excited when it comes to events like these. Meeting people, taking photos and learning new things. I have to shop on something to wear or dig in to my closet before friday falls. Hope to see you there! For more details visit www[dot]fashionistasecrets[dot]com.